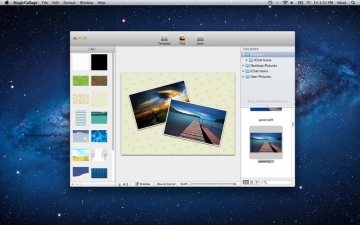 [無料] MagicCollageLite | Mac App Storeのアプリ検索・ランキング BuzzMac! 1. Max 4 pictures per template. 2. Max 5 pictures in joint mode. 3. Can not choose 'Big' and customize output size. MagicCollage is a amazing tool for you to make your favorite pictures into one! * Provide 3 different picture arrange style. * Over 40 templates to place your pictures. * Change the canvas ratio anytime. * Use your own pictures as canvas background. 1. Template style, MagicCollage provide over 40 most-used templates, simply drag pictures from hard disk or the image collection view to the template frame. And you can download more templates from our website. 2. Free style. Place your pictures anywhere with any angle on the canvas. 3. 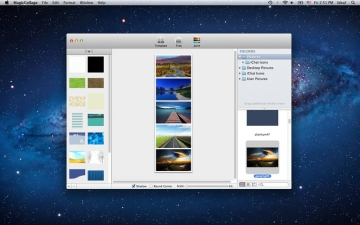 Joint style, Arrange your pictures one by one, and you can change the picture order by drag them in the canvas. 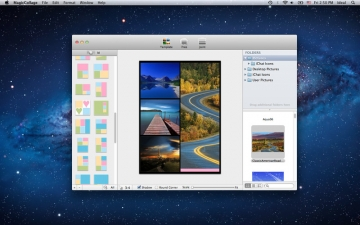 You can use your own pictures as the canvas background. And you can change the canvas ratio manually.